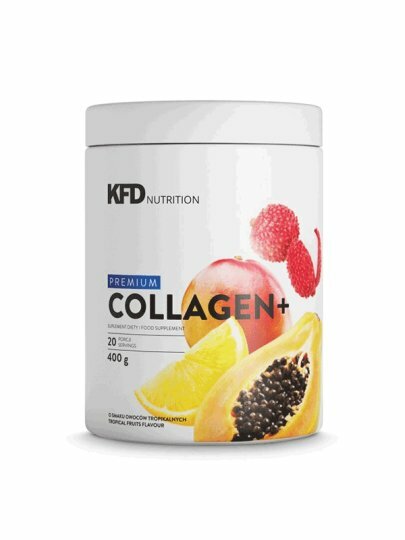 KFD Premium Collagen + is a new high-quality dietary supplement intended for those suffering from pain in the joint and peri-articular structures (ligaments, joint capsules, cartilage, tendons, bones) or who want preventive treatment over their joints, skin, hair and nails. Gelatin hydrolysis (MGM), maltodextrin, methylsulfonylmethane (MSM), L-ascorbic acid (vitamin C), acidity regulator: citric acid, chondroitin sulfate sodium, calcium carbonate (calcium), black carrot extract, aroma, including 65% bosky acid, DER 5: 1, sweeteners: sucralose and steviol glycosides, hyaluronic acid, cholecalciferol (vitamin D). One serving is 16 g (product weight - 20 g). Spread 16 grams in a glass with 100 to 150 ml of water and stir until you achieve smooth consistency. Leave for a few minutes and consume it. It is used according to individual requirements, not more than one dose per day. The best results - when taken on an empty stomach and immediately after preparation. When used for prevention, it is recommended to take 1/2 dose (8g) of Premium Collagen + dissolved in half the water (50-75ml).